6 Months of study, from 640 in Apr to 640 in Sep! Originally posted by clee1827 on 03 Sep 2017, 14:06. Last edited by clee1827 on 03 Sep 2017, 21:32, edited 1 time in total. Sometimes the first test doesn't go as planned. Don't worry, get your ESR and look at the section you performed poorly. Spend a lot of time imporivng that section and you can gain a higher score. If you were to ask me, this score is probably just pressure playing its part! GMAC has publicly stated that the Official Score that you earn on Test Day is within +/- 30 points of actual ability. Assuming a similar 'swing' in how your CATs function - and if we ignore the 750/Q51/V40 (which was an 'outlier' on many different levels) - most of your CAT score results show that you essentially performed the same each time (660 +/- a few points). By extension, this 640 isn't that surprising - it's at the "lower end" of your range, but it IS in your range. You mentioned something that makes me question whether you took your CATs in a completely realistic fashion. If you took those 19 CATs in a realistic way, then you would have had 38 8-minute breaks to deal with. Over the months and months of practice, you should have developed a pretty good 'sense' of what 8 minutes "felt like" and tailored what you did during those 2 breaks to properly fit that timeframe. On Test Day though, you had to ASK how much time had passed - and then you were surprised by the fact that it was 12 minutes. Thus, if you weren't properly prepared for that part of the Exam, there were likely other areas that you also weren't properly prepared for. Test Day is a rather specific event - and to score 720+, you really have to train for every aspect of it (including what you do throughout the Day of the Exam and what you do during your 2 breaks). 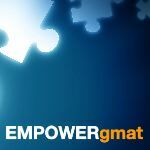 Now that you've faced the Official GMAT, you should be able to use that experience to better prepare for your next attempt. To raise your score 80 points though, you will likely need to invest in some new practice materials and learn/practice some new Tactics.